Good product. Used this remote to take some pictures of hummingbirds coming to my feeders. Product is a very nice addition to my camera bag. Note you must use the on camera (D5100) menu system to use the remote. I ended up setting the duration to look for the IR remote to 15 minutes. Nikon used to have a wired remote that required a two-step operation to fire the shutter. First, you depressed it halfway and then all the way once the camera came into focus. The new IR remotes are supposed to do that two-step process automatically ... or to refuse to shoot if focus isn't attained. With my camera, a D7100, the remote would take pictures without first focusing. That's really annoying. The solution is to turn the camera off and on and work the remote again. That's both cumbersome and silly. The old way was much more predictable. 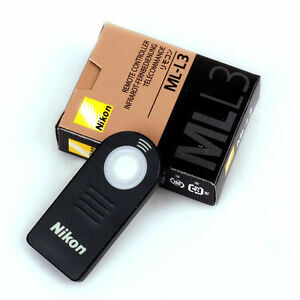 This is a handy little item to throw in your camera bag. It’s a lot better that setting a timer and guessing when the shot will fire when doing group shots. Price was low ( $5.00) so I was skeptical but figured it was worth the low risk. Turns out that it works great right out of the bubble-wrap – just remember to set your camera menu to remote and you’re set. It looked like a new OEM Nikon brand ML-L3 wireless remote including the box but for some reason it quit working the second time I tried to use it. I removed the battery and it looked all scratched up like it was old. I bought a new battery for it and as I was trying to replace the battery holder into the remote a piece broke off of it. I got it back together and it seems to be working now but, I am not too happy with it. Because of this experience I could not recommend this item to anyone and next time I'll just spend the extra money and buy one from a reputable dealer. Smaller than I thought would be ,easy to pack ..does the job .